Rigby embarks on a wild hunt to rediscover his favorite childhood flick that chronicles the harrowing adventures of dinosaurs from spaaaaaaaace! Accompanied by Hi-Five Ghost, Rigby accidentally unleashes an unruly terror on the population of earth. Mordecai and Muscle Man think this endeavor is intensely lame, but it’ll take the four of them to undo the damage. New alliances are formed! Not-so-great films are watched! And dinosaurs will rule! 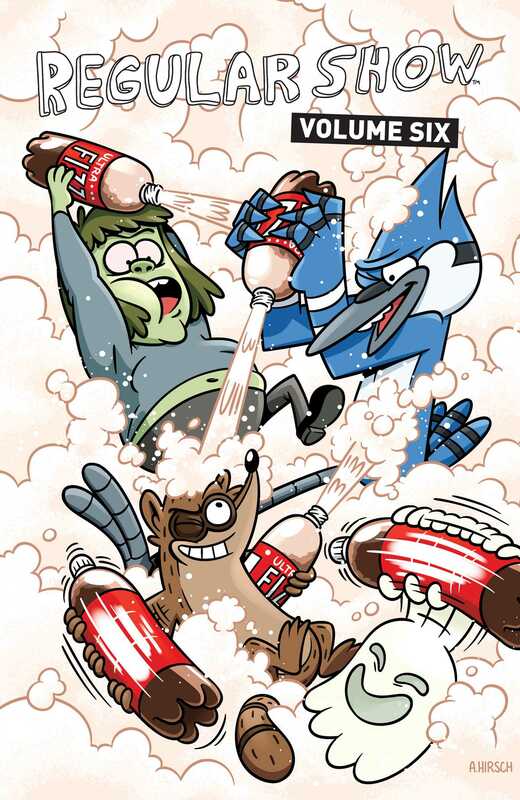 Escape into a magical world of nostalgia and VHS tapes with the outrageous duo Mordecai and Rigby in Regular Show Volume 6, which collects issues #21-24 written by Mad Rupert (Regular Show: Skips) and illustrated by Allison Strejlau.